As always, I enjoyed the podcast, even if sometimes it sounds as though you all are watching a different show. Hey, I liked "The Caretaker." Maybe I'm easily amused. One thing, though, that Sen said early on that I thought I should respond to: that the Doctor’s treatment of Danny was “borderline racist.” I’ve seen other commentary along those lines, so while Sen didn’t follow up on the remark, I assume it referred to the Doctor hectoring Danny as “PE,” and claiming to reject the idea that Danny could possibly teach math(s). Any time there’s a black actor, someone out there is going to claim that criticism of the character is racially-motivated. 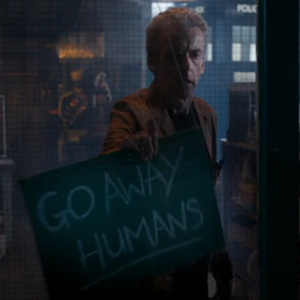 But the rest of the season has made it clear that the 12th Doctor has a thing against soldiers. What’s more likely: that the Doctor thinks soldiers can’t be smart, or that this incarnation has suddenly developed racist tendencies? Hell, the 12th Doctor can’t seem to distinguish among humans - I’m not sure we have evidence that he knows Danny is black! While I’m crankily commenting, I rather liked Series 8’s version of Clara. Sure she’s a terrible role model for kids - her attempt to betray the Doctor in the “Dark Water” was jaw-dropping - but, let’s face it, neither is the Doctor, especially this one. I share everyone’s disdain for Courtney, however. The actress did a great job, but the character… yecchh. Looking forward to the podcasts on the rest of the season… whenever they may fall. I run an independent publishing company, and was wondering if you'd like to interview the author of our latest Kindle book, "The Mysteries of Dr Who" - an exploration of the deeper meanings and unanswered questions inherent throughout the show's storylines. Lynn Hamilton is a full-time freelance writer and longtime Dr. Who enthusiast. You can read a little more about the book below, and a PDF file is available upon request.